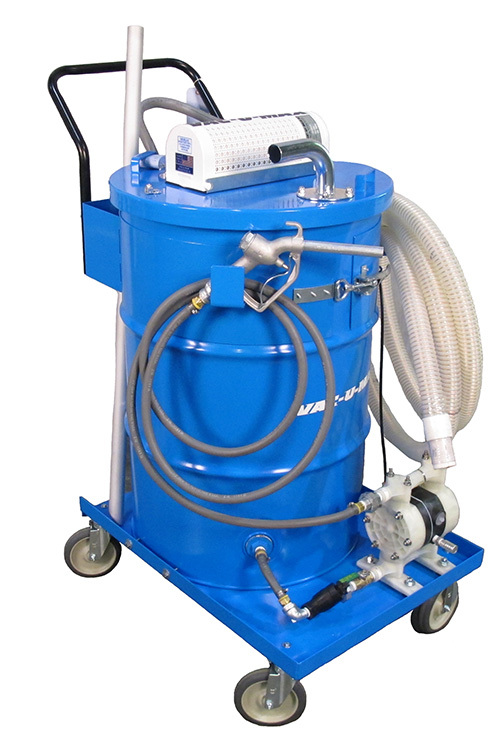 The VAC-U-MAX Model 55MW is a heavy-duty cleaning system for 100% liquids or liquids with solid particles such as metal chips or shavings. Operators can quickly empty machine tool sumps, machining beds, oil / water separators, parts washers, rinse tanks, and clean up liquid spills. Solid particles are separated from collected liquid with the VAC-U-MAX Chip Basket and liner. An operator can pick up liquids at rates of 1-2 gallons per second (60-120 GPM). The operator can return the coolant to the machine tool sump, or transport the vacuum to a central filtration system. Convert from “Pump-In” (vacuum) mode to “Pump-Out” (pressure) mode with the turn of a lever and pump out the liquid contents of the drum through the discharge hose. The operator has full control of the liquid discharge rate with the lightweight dispensing nozzle on the discharge hose. Quiet operation. 85 dBa. Meets OSHA standard.